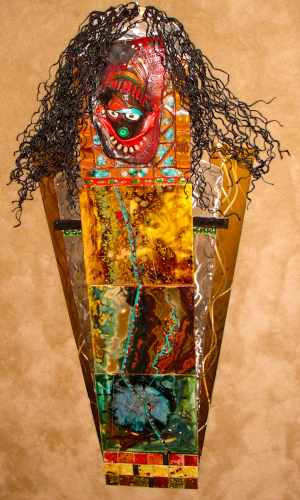 This is one of four in the Warrior Diva series of mixed-media two- or three-dimensional sculptures. 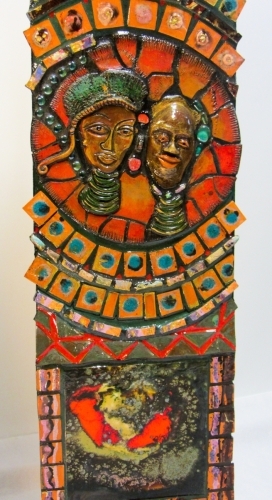 The center body is made up of clay tiles with painted stones running through, topped by a clay mask with flowing braided hair. 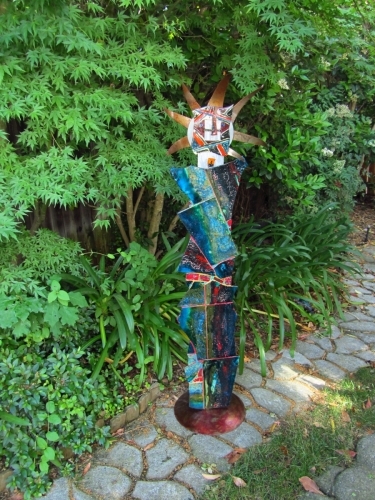 The arms are of untreated steel (silver) and acid-washed powder-coated steel (gold) on which I have used different angle-iron grinders to achieve the textured effect. Shipping and handling charges are additional. 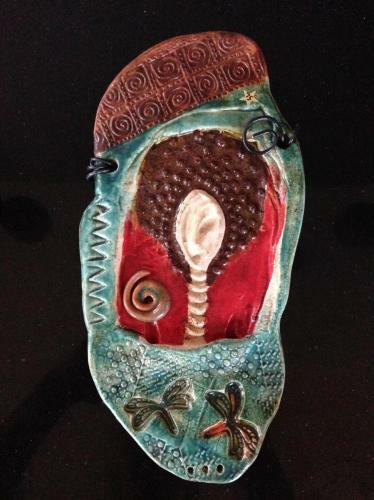 Ceramic figure representing "Yin" energy: sensuous curves, that cool and calm energy that you can draw on in times of stress. Leather straps bind the head to the body. Shipping and handling charges are additional. 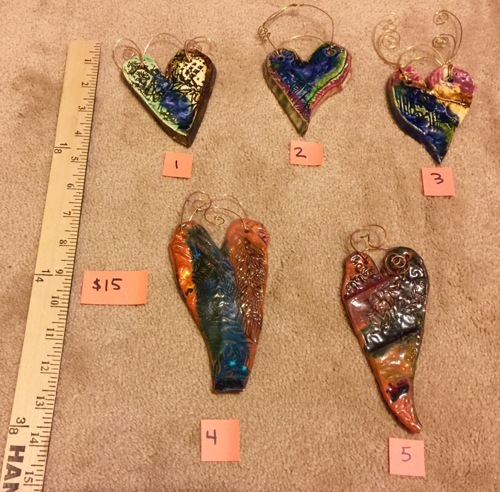 These one-of-a-kind ceramic hearts are glazed with vibrantly earthy colors and outfitted with intricate hanging wires. 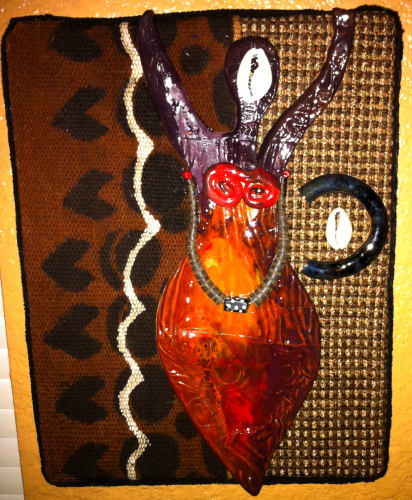 They make great gifts and additions to your home, office or garden. 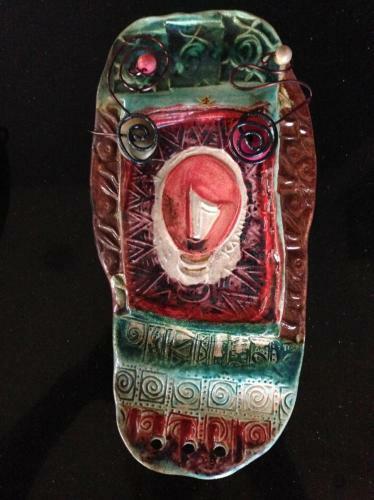 This wall piece was fired in a raku kiln giving it a smoked look, especially in the textured edges. It may be hung inside or outside. 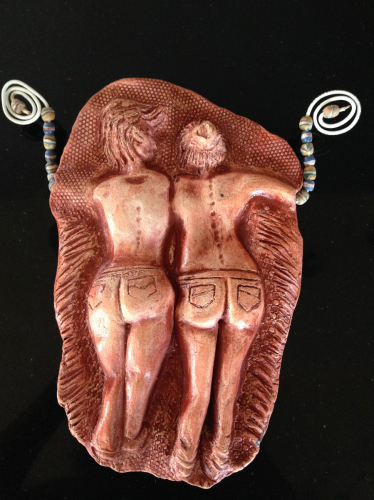 Two shapely women show their assets. Shipping and handling charges are additional. 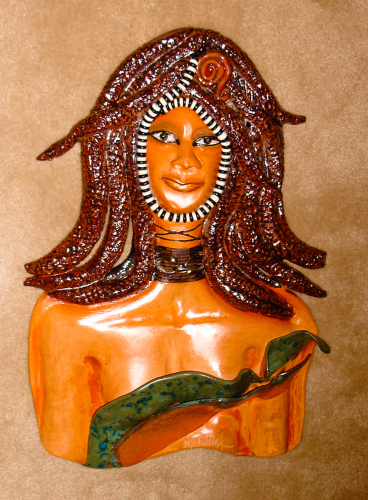 Using African mud cloth as a backdrop, this clay goddess sculpture is bolstered by a cowrie shell and a clay swirl representing everlasting life. 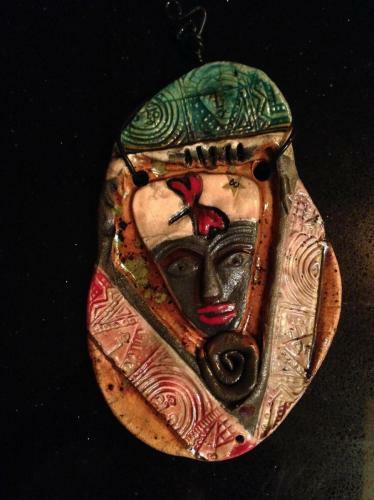 Clay mask with African fabric headdress. Shipping and handling charges are additional. 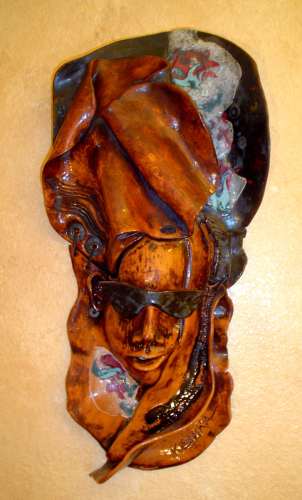 African wall figure that uses Egyptian themes of kohl eyes, snake-like beading around the face, and textured braids. Shipping and handling charges are additional. 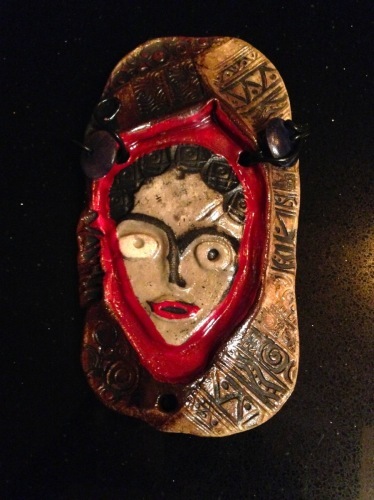 This clay mask is a cross between a traditional wooden African mask with a contemporary face, cool shades, and the first time Kanika used molten clear glass on a clay piece. Old and new. Ancient and cool. Juxtapose! Shipping and handling charges are additional. 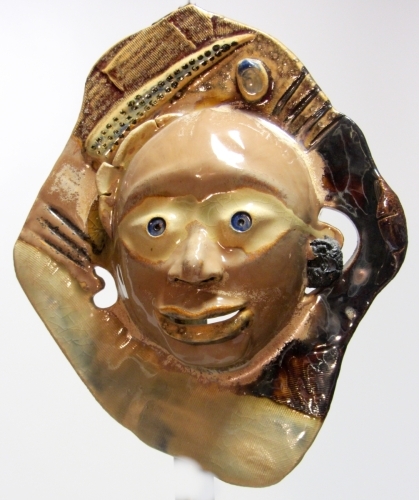 Clay mask made in 1991 using high fire glazes and lots of texturing in the headdress. 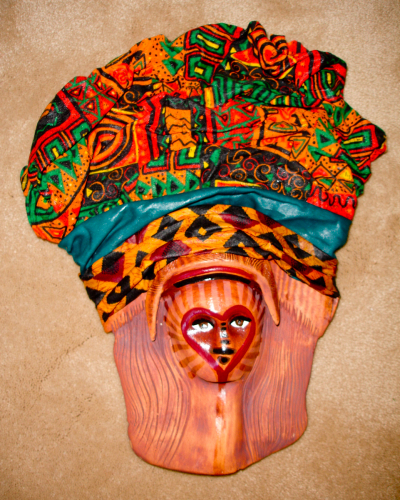 The depth of the electric gaze impart an intensity to this mask. 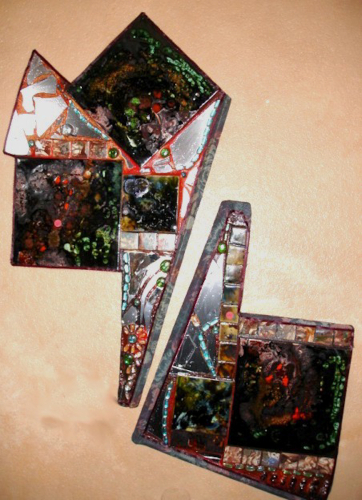 This was a first attempt with imbedding mirror pieces in with clay tiles and glass. The mirrors grab light and help to refract it in interesting ways. 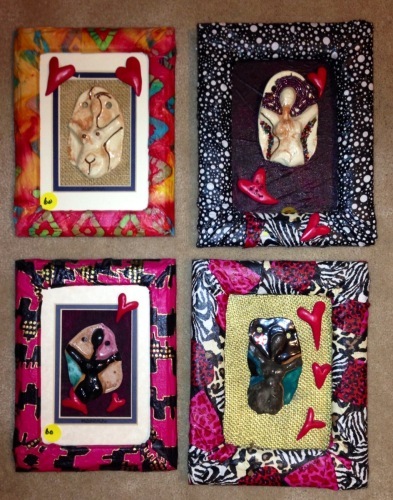 Each of the pieces may be hung from at least three different angles. 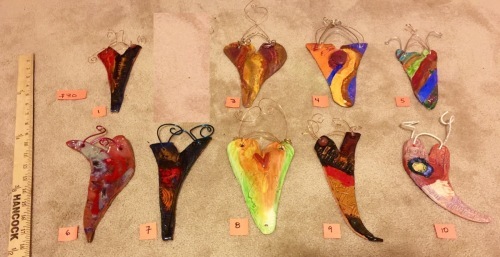 The combinations of hanging the pieces are endlessly exciting! Shipping and handling charges are additional. 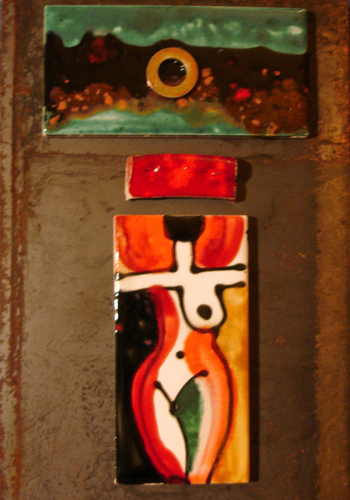 Tile mosaic with two lovers in the center of the universe. Coupling. Shipping and handling charges are additional. 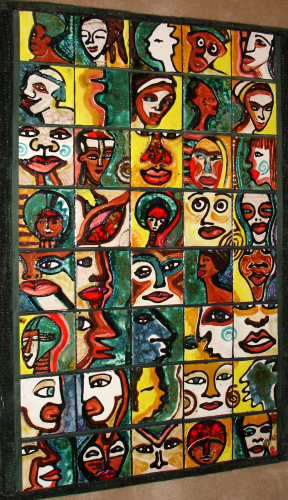 Forty 4"x4" tiles were painted at the same time, back to back. You may notice that each of the face tiles flows into the next one. It is like how each of us flows into the lives of our neighbors, friends, and families. You are never alone. There is always someone to watch you, watch after you, love you. This is the first in a three-part series. Shipping and handling charges are additional. 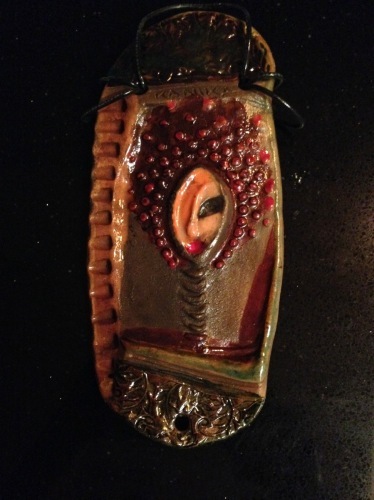 Ceramic heart in sizzling hot fabric-covered frame. 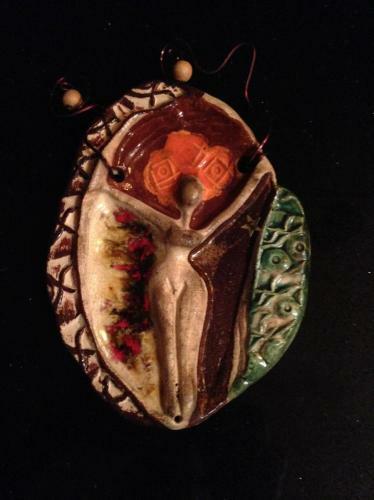 The velcro-backed goddess pendant may be removed and worn as wearable art.